People who know me better know Paulo Coelho is one of my favorite writers. In 2011 he wrote Aleph. In this book he writes about a journey he always dreamt of making. Searching for Aleph… Interesting and nice to read book. I read it in English and Dutch. I prefer the English version. You can find the Dutch by clicking on ‘Nederlands’ on the language button on the right of this article. Clicking on the picture will bring you to the Amazon website. 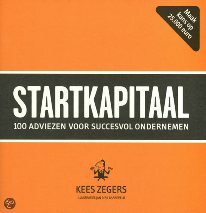 At the moment I am reading the book “Startkapitaal” written by Kees Zegers. It’s in Dutch. He shares some tips and anekdotes about his experience as entrepeneur.